Clinton’s 14-foot lead rope is designed to get maximum results and to keep you a safe distance from your horse when beginning training. This is an important safety aspect as it allows you to stay a safe distance away from your horse while working with him. Listen to Clinton explain the importance of having a 14-foot lead rope in this video. 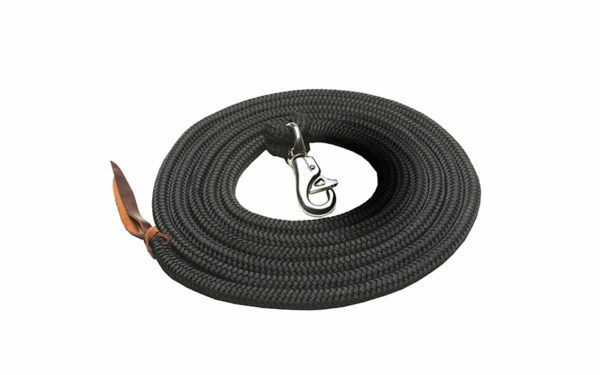 Made of high-quality marine yachting rope. Extremely durable and will last for years in any environment. Whatever energy you create at one end of the rope will end up at the halter, unlike most conventional cotton lead ropes where the energy stops halfway down the rope. This allows you to have better communication with your horse. Won’t become slippery if it gets wet or sweaty. Comes standard with a one-handed stainless steel bull snap that is removable. Because the whole snap, including the spring, is stainless steel, it won’t rust. Easily open the snap with one hand. If you need to remove or change the snap, you can do it easily without having to worry about damaging the lead rope. The end of the rope is spliced back through itself, creating a weighted end. This makes it easy to twirl, swing or toss the rope during training sessions. Adds bite to the end of the rope so that you can twirl it to get the horse a safe distance away from you. Because of the tight weave, it won’t snag as easily as other lead ropes on the market. Lasts longer than traditional lead ropes. Creates optimum energy in the rope, whatever energy you create at one end will end up at the other end. All lead ropes are hand-spliced. Every lead rope is individually hand-spliced to fit Clinton’s exact specifications.